For 50 nights last fall, Breck Owens often slept with a laptop computer on his chest. It was a critical link that let Owens communicate with a torpedo-shaped glider on a pioneering mission across the turbulent Gulf Stream. “Without constant two-way communication, this mission would have been dubious at best,” said Owens, a physical oceanographer at WHOI. 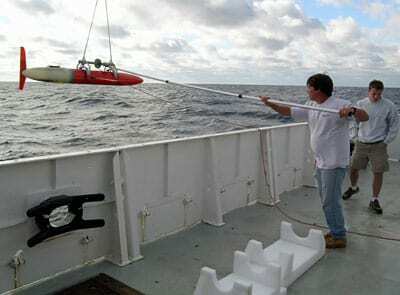 Seven sleep-deprived weeks on Cape Cod paid off when the glider safely arrived offshore Bermuda, a 600-mile trip that proved the viability of a remote-controlled glider called Spray for ocean research. 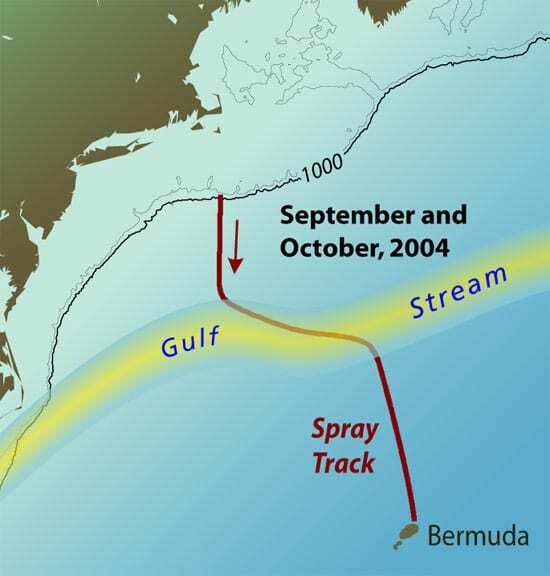 News of the first successful Gulf Stream crossing by a glider last November—and the launching today (Thursday, March 24) of Spray’s seven-week round-trip mission from Bermuda across the Gulf Stream and back—has caused a ripple among scientists, who recall the dream of famed WHOI oceanographer Henry Stommel. Nearly two decades ago, Stommel imagined fleets of unmanned robots, roaming over hundreds of kilometers of remote seas and repeatedly diving below the surface to gather water temperature, salinity, and other data on the oceans over weeks and even months. Such roving robots would provide more comprehensive and frequent data coverage across the ocean’s length and breadth to develop, for example, a more complete picture of ocean circulation and more accurate weather and climate forecasts. “We can’t be at sea all the time, so the next best thing is to send robots out to do work for us,” Owens said. He and Davis had lofty aspirations for Spray. Its name honors the sloop Spray, sailed by Captain Joshua Slocum in the mid-1890s during the first solo circumnavigation of the planet. “It took time for technology time to catch up with Stommel’s dream,” Owens said. The same satellite and electronics technology that in the past decade have given us cell phones and the Internet have opened new doors to scientists researching the oceans. Two satellite-based systems in particular proved helpful when researchers began designing Spray in 1998: Global Positioning System (GPS) satellites and Iridium satellites, both built for navigation and communication uses. Gliders like Spray resemble large model airplanes, with a cone shaped-nose and two flexible wings. Moving at a speed of a half-knot, every three miles it dove a half-mile below the surface, collecting data during its ascent. To keep Spray streamlined, prevent snags, and protect against corrosion, gliders lack external moving parts or motors. Spray moves by altering buoyancy. To ascend, for example, Spray uses a hydraulic pump to move four cups of mineral oil between two bladders. The oil’s shift thus increases the glider’s volume, making it less dense than surrounding water. The same mechanism adjusts Spray’s pitch. To roll the vehicle, a battery module inside Spray shifts to tilt the weight within the finely balanced vehicle. All equipment—from the compass in the vehicle’s nose to the electronics equipment, sensors, and 26 pounds of batteries—are housed inside a lightweight aluminum shell. 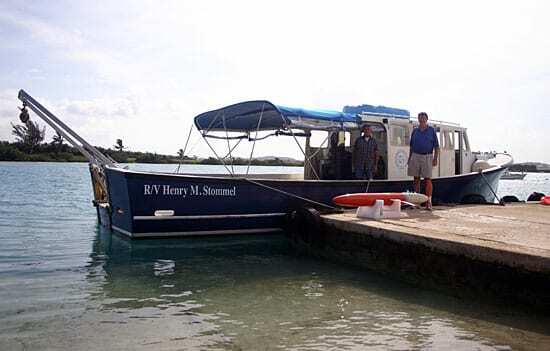 Last summer, malfunctioning equipment aboard Spray cut short earlier missions, and the scientists had to recover the vehicle after a few days at sea. 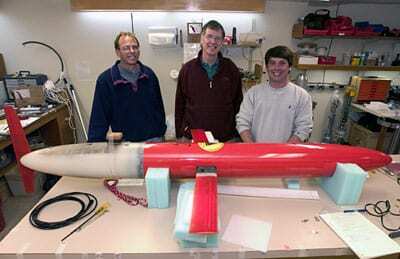 But on Sept. 11, 2004, they launched the 112-pound glider from Nantucket and watched it head south. Satellites have been orbiting since the days of Sputnik in the late 1950s, but the oceans present a unique barrier that never hindered communications on land, in air, or even into space: Radio waves cannot be transmitted through seawater. “We had to figure out a way to get around all that water,” Davis said. Between each dive, Spray floated for about 15 minutes on the sea surface and rolled on its right side to expose its right wingtip, embedded with a GPS antenna. After securing its location from a GPS satellite, it rolled to its other side and pointed its left wingtip skyward. This housed another antenna for transmitting its location data to Owens via satellite. Through the same wingtip, Spray also received e-mail messages from Owens containing modifications to dive plans. “We could tell it to head south awhile, then head southwest,” he said. Ever mindful of storms, rip currents, and unusual eddies, Owens gathered weather and sea reports and provided Spray with the necessary directions to keep on course. 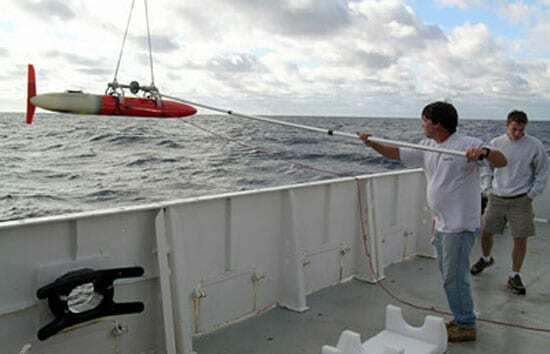 Though thrilled about the first successful crossing, Owens said that improvements are needed before the long-range plan of using multiple gliders in the ocean can be realized. These will include new sensors to measure ocean currents and other physical, chemical, and biological properties of the oceans, and improved abilities to handle more navigation tasks without as many updates from Owens.